Recently I had an opportunity to participate in a discussion with a group of fellow cartoonists regarding our favorite drawing tools. This has been a favorite topic among cartoonists for decades...long before anyone who is drawing cartoons today was even born. 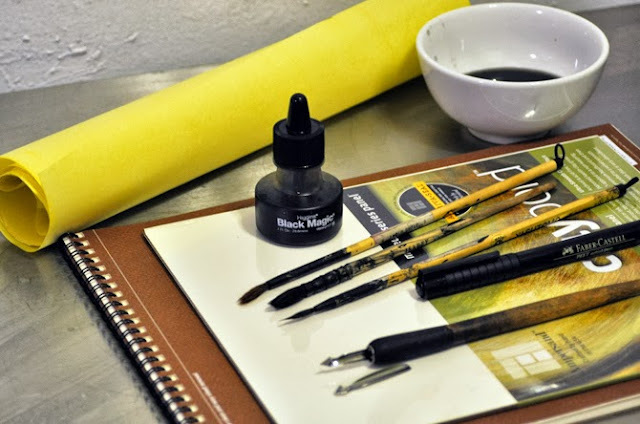 While things have changed greatly in recent years, the reasons for using specific drawing tools are just as personal as they have always been. 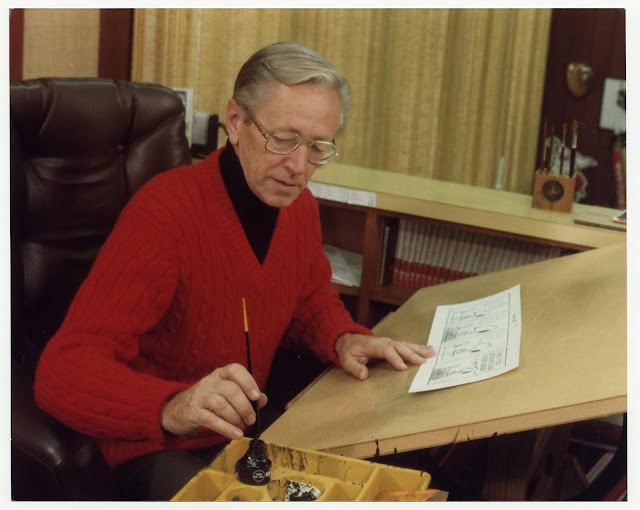 Charles Schulz swore by a Speedball C-5 pen with India ink on Strathmore bristol board..others, like Walt Kelly loved using a brush. Many of those pen and bristol boards have disappeared, with some replaced by newer versions. Now that I think about it, the list of options most cartoonists use has actually narrowed in recent years as much as the technology has advanced. I was surprised to find that many print cartoonists still use traditional pens and ink with paper. I was taken aback because almost every professional illustrator, commercial cartoonist and animator I know or talk with draws digitally today, mainly to save time. The fact that many comic strip cartoonists are still drawing on paper is interesting...but I completely understand the thinking. For one, if it works well, why change it? When I first worked as a newspaper political cartoonist, I used a brush with india ink, favoring its expressive line. Later, as I drew comic strips for newspapers, I added archival ink pens to my arsenal, as well as Staedtler Pigment Liners. The strength of the pigment in those pens was terrific for print reproduction. In the past ten years, as I have transitioned from newspapers to full-time book illustration and advertising/corporate cartooning, I have gradually gone digital. Doing so has streamlined my process considerably; in fact I have not picked up an ink pen or brush for use in a client project in over five years. 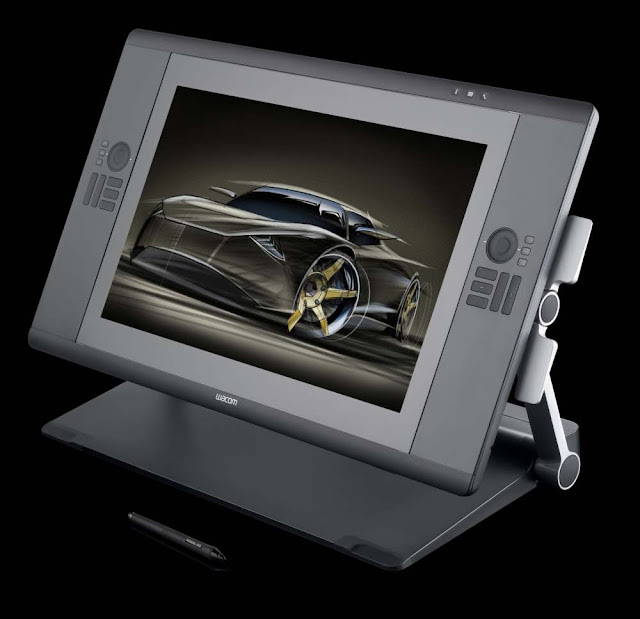 More recently I have also owned two Wacom Cintiqs, (investing in the aforementioned new HD model a few months ago). Simply put, it allows me to create a much higher volume of artwork than would be possible with ink and paper alone. If you're worried about the learning curve -- and yes, there is one...it is worth it. But it is much less than with the Intuos, which involves drawing on the tablet while looking at a separate monitor. Also, I wondered about losing the tactile feeling of working on paper with ink, or even keeping originals. But the feeling of the Wacom pen has its own merits. Additionally, as my wife can attest, having thousands of cartoons and illustrations on a hard drive is much easier to store and manipulate than the previous piles of originals that I still have stored in flat files in my studio. If you're curious, I'd suggest trying a recent model Wacom Bamboo or Intuos to start, especially if cost is a barrier. With the programmable shortcut buttons allowing quick changes between brushes and pens or revising of mistakes, you'll be amazed at how quickly you can create and revise professional-quality artwork that is indistinguishable from images created on ink and paper...and you can complete it in half the time. With all that said, I still like to use pens and brushes for my own enjoyment on personal projects. But when numerous deadlines loom, drawing digitally helps me to get it all done on time. I have wanted to review the recently-released Wacom Cintiq 24HD for a while, but have been so swamped that it fell by the wayside. (It's not so "new" now that several months have passed since I purchased it, but it is still worth sharing a few thoughts and reactions.) After wrapping up a couple of lengthy book illustrations projects, I finally decided that I'd take a few moments to discuss it, because it truly is a great tool for artists, cartoonists, illustrators, and animators. 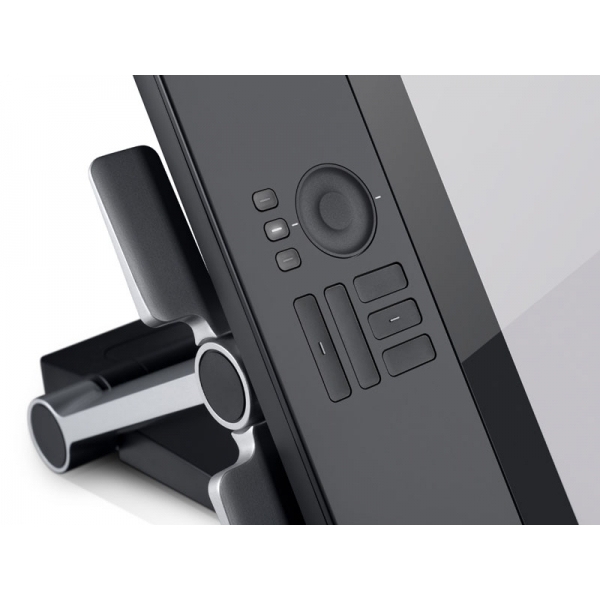 So, onto the new Cintiq 24 HD and its features: Simply put, the Wacom Cintiq HD models are brilliantly designed and engineered. But they are also not cheap. Thus, it is often with some reservation that anyone considers biting the bullet to try one...especially given the fact that Wacom does not have any showrooms for test-driving one. Unless someone you know has one and will let you try it, you either just buy it and trust the idea that it might help you, or you sit and wonder. The Cintiq is so big that you can fit nearly any project imaginable on its screen. It also has so many Express Keys along with the Radial Menu, that you can have presets for any function or tool. Despite the size of the screen, I still like my second monitor, (a 27" iMac), so I have the Cintiq positioned on an Ergotron arm to the side of of the Mac. I can keep all of my other windows, browser, music player open on that display. By pressing one of the Express keys to ‘Toggle Display’, I can temporarily jump to the other monitor, and the Cintiq becomes just like a traditional Wacom tablet. I have added one other not-so-common third device to the mix: a Wacom Intous 5 touch. It allows me to enlarge, rotate and manipulate everything with my left hand my left hand as I draw with my right on the Cintiq. I simply love the seamless flow that results. Wacom also put a USB port right on the display itself. It seem like a minor thing, but I frequently take images with me or grab them from a USB key...I can also pug in my iPad or iPod. This is just convenient. 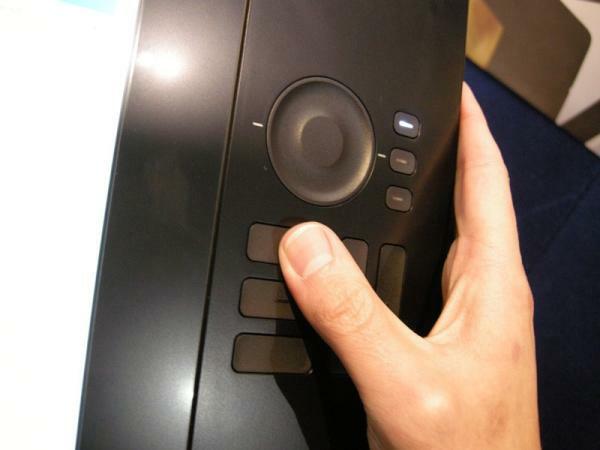 Wacom put a Tablet Properties button on the device itself. This is helpful because it gives you quick options to open the properties, make changes, then get back to work. It’s easy to program an Express Key to select tools, change image or canvas sizes or even to save a file. I really like the fact that there Express Keys on both sides of the screen, plus two touch rings; so in total you get plenty of options for customizing your Cintiq so it works perfectly for the way you work. The Cintiq is a true joy to work on. It is so well designed that I can’t think of anything I'd want to add to improve upon it. As someone who sits all day long while I work, I have considered getting one of those expensive adjustable desks that allows a person to work standing up once in awhile. I no longer have to think about adding that to my studio, because the Cintiq lets me stand when I need a break from the chair. I used to stand and draw at my first paying art gig in college, (as a cartoonist for the student newspaper at the University of Illinois)...and this allows me to take a step back to those early days.) I've done so many times in the past few weeks and I'll tell you, me and my lumbar region love having the option. The real strength of the Cintiq is drawing directly on-screen in HD resolution with 2048 levels of pressure sensitivity...and for my particular professional niche, it benefits me in doing detailed color work, for say book covers, magazine illustrations, or even things like the caricature/painting commission in the photo above. It allows a level of precision that is equal to painting or drawing on actual canvas/paper/watercolor board, etc. But it also flies at Mach one with simple black and white cartoons. The Cintiq more than paid for itself last month when I used it to create over 40 cartoon illustrations for a book in less than two weeks. (That includes sketches, revisions and finished artwork.) I'd estimate that using an Intuos would have taken 50% longer, (or perish the thought, pen & ink on bristol, three times as long)...hence, I could not have made the rushed deadline -- in which case the publisher would not have hired me. Well, I'd better get back to it...time to turn on my music and have some fun! Pretty cool. Would love to try one of these sometime. Definitely on my new toy list! It's terrific to hear from you. How are things? Folks, Michael Hawkins is a fantastic cartoonist...he is also from Illinois...who also worked at the University of Illinois' student newspaper, "The Daily Illini". Suffice it to say we bumped into each other there more than a few times.